January 4, 2018 By Tiffany Ivanovsky 2 Comments By clicking on our links, we might make a SMALL commission - Thanks for the support! See our full DISCLOSURE here. 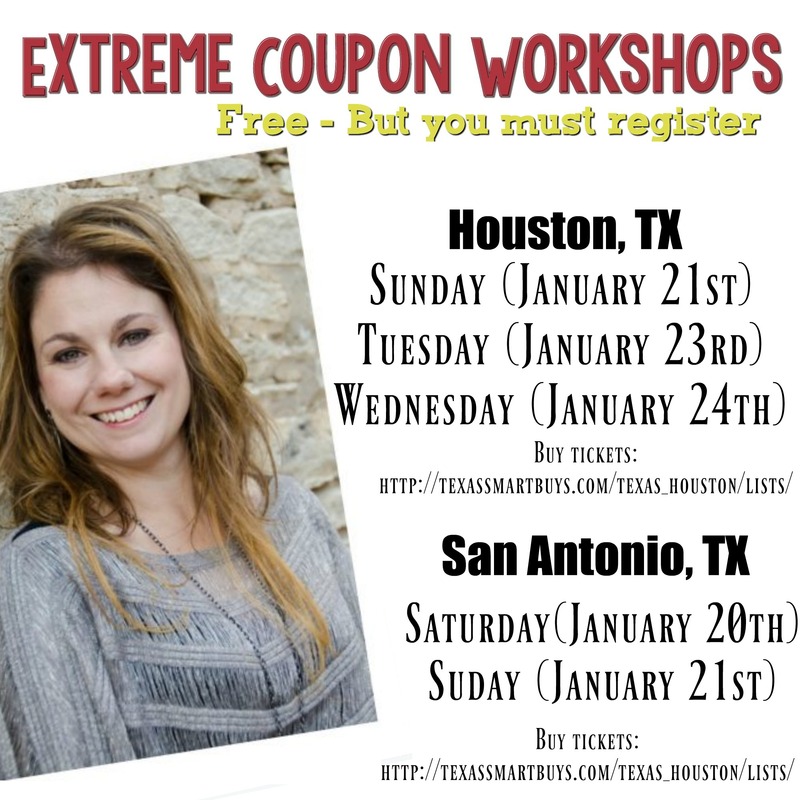 I have a bunch of free upcoming coupons classes that you can register for. You don’t want to wait too long as they will sell out. These classes cater more to the beginner couponer, but it is always fun to meet other couponers. The class is a little over an hour long, and I cover everything from how to get started, where to find coupons, what method I personally use, how to do a clip-less method of couponing, and then how to get the best deal on coupons since you need them to coupon. Handouts are provided, just bring a pen. Nursing babies are welcome, but with any event should they need a break just feel free to walk them around. Kids are usually bored out of their minds, so if you can leave them home or trade babysitting I would do that. Click the city and date to register! August 23, 2017 By Tiffany 2 Comments By clicking on our links, we might make a SMALL commission - Thanks for the support! See our full DISCLOSURE here. OK so we have made it 10 days! Today we are going to be talking about meal planning and menu planning! WAIT, WAIT, WAIT… don’t tune me out yet!!! I know it sounds a little boring…. but I promise if you read through today’s info, you will be so happy that you did!! You can check out my menu plans HERE. Yesterday in the mail, you should have gotten your grocery ads. If you don’t in the mail, you can pick them up at the store, or look at them online. 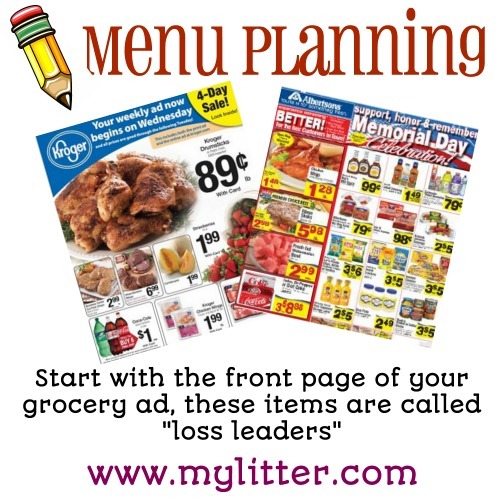 This is a good time to look at making a menu plan for the week. Take notice what is on the front page. These are the things the store wants you to see to get you in the store, they are called “loss leaders” and stores are willing to take a loss on them for you to shop there. PLAN your meals starting with the protein on sale on the front pages of these ads. Since the biggest part of my budget is spent on meat (protein) fruits and veggies. I try to make sure that I am getting my meat/protein as cheap as I possibly can. If I didn’t get it from Zaycon, I got it from the front page. Because the biggest part of my budget is on meat/produce/fruit I want to get the best deal possible on those items. That is why I typically shop off the front page of my ads. One of the questions I get asked the most is how do you save on meat and produce. Go to http://bit.ly/zayconvideo to see a video of how to store my chicken from Zaycon. Meat – I use Zaycon. 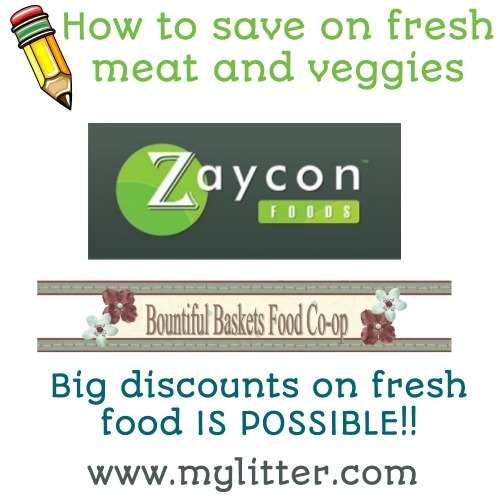 Zaycon is a company that delivers super high quality AWESOME fresh meat to your area cutting out the middleman and saving you a TON of money. To order, you must be registered (link is in my bio) and already be logged in to your account. On the main “My Account” page, scroll down the list of upcoming events, find your preferred event and click on the “Click here to place an order” link. Buying in bulk is one of the ways that I save a lot of money on food. You do not have to have a large chest freezer to store this much chicken. Also, consider splitting an order with a friend or neighbor. The chicken is 100% natural chicken with no added hormones, additives or artificial ingredients, and will be priced around $1.84 a pound!!! Produce – One of my favorite ways to save on produce is from Bountiful Baskets. They are a volunteer run food co-op where you are able to pick up weekly baskets of fresh produce. If there is not one in your area, you can actually get one started with their help! I wanted to write up a post on how to save money on produce for a long time. We just go through SO much produce all year round, that much of my food budget goes to fruits and vegetables! Plus, what kind of Mother would ration produce from her children? This one has! There are also not very many coupons for fruits and vegetables! 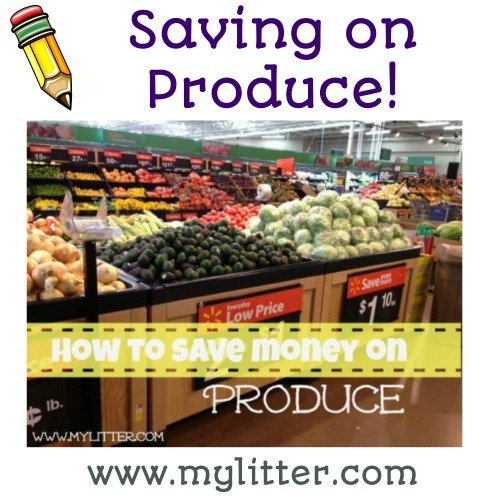 How do I save money on produce? A few different ways. By finding some coupons. Target occasionally has Target store coupons for produce, WATCH for them! You can also type “produce” into the coupon database and see what is available. Find a discount grocer: Thankfully, we just had an Aldi’s open near us and I have been able to get some awesome deals there. they are a little farther away, but worth the drive a few times a week. Start a fruit and Veggie Co-Op: This might be scary, and you might not think about doing it yourself, but if I can do it you can easily! Find the closest grocery district and check the prices and quality of the different grocers, get a group together and develop a schedule. Click HERE for how we did ours. Looking for Organics? : Many grocery stores carry a big variety now, so you can start there. Also check out Local Harvest to see what is in your area as far as farmers markets go. I LOVE farmers markets! The veggies and fruits always seem to taste better and look better! Let your kids pick out things they have never had before to try. Farmers Market or Grocers Market: We have a number of farmers markets in our area. But if I want to do some driving I can head into downtown to the actual grocers markets where the restaurants and stores buy their produce. It is a really cool experience, and you can save a lot of money, but I just don’t have the time to do it! Take notes!! We can’t possibly do everything alone. 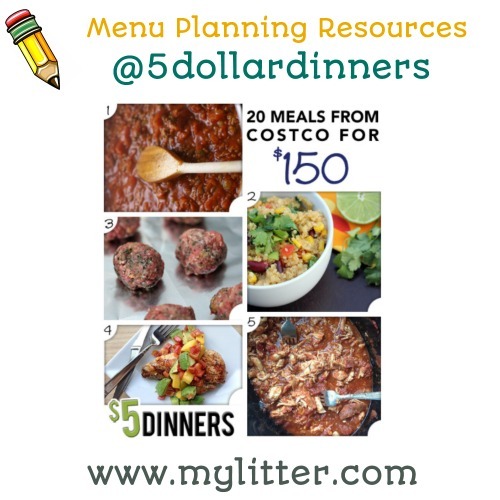 There are people out there that do a great job of what they do and for meal planning that is @5dollardinners if you are not following Erin Chase you are missing out!! She is the master at meal planning and she helps you do it too! Oh, and she will be on The Today Show THURSDAY morning talking about meal plans! I have done many free menu plans as well that you can check out HERE. $5Dollardinners helps you do just what the site is called, she can help you make your meal plans with your meals costing just as little as $5! Below is a list of all of the pre-made, menu plans that Erin has listed currently. Erin offers the complete grocery shopping list, as well as complete recipes with ingredients broken down to make it easy for you. August 20, 2017 By Tiffany Leave a Comment By clicking on our links, we might make a SMALL commission - Thanks for the support! See our full DISCLOSURE here. Sorry for the postpone yesterday of our coupon class. The Kroger mega event threw us all off! There was so much to post on all the good deals and trying to help everyone figure out how to shop the sale took up the day!Day 7 of our coupon class is going to be all Walmart. We will have a few “experts” giving us some awesome tips on how to make the most of your shopping experience there!Are you ready?! We will start with Walmart today. Walmart is the #1 retailer in the country. As much as I love Target, I am in Walmart a lot more. And for MANY people they ONLY have a Walmart.Today we are going to be covering the Coupon Policy, the Ad Match policy and Shopping Strategies at your Walmart store. 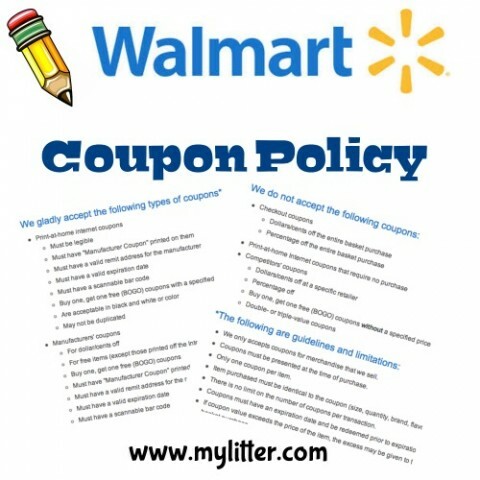 The Walmart coupon policy had a major overhaul in 2011. It became very coupon friendly and added the element of overage which is really cool. It is always very important to print a copy of the policy and have it with you when you are shopping there. The biggest obstacle I have had at Walmart is a cashier that doesn’t know their own policy. 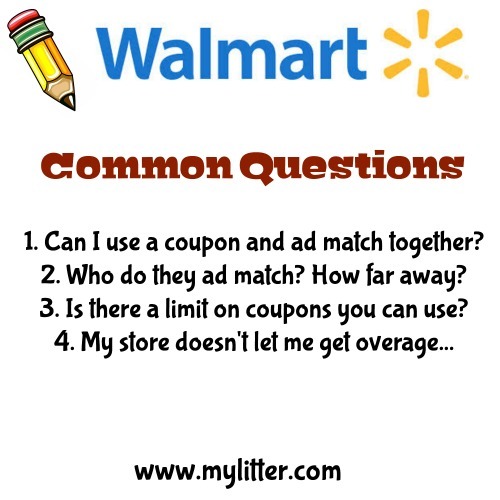 These are some of the most common questions @iheartthemart and I get asked about Walmart. 1. YES! You can use a coupon and price match! Walmart wants you to get the same deal at Walmart that you can get at another store. If you couldn’t use a coupon on the item, then why price match it?! You could get a better deal at the other store! Sometimes when I have explained o that way to a cashier they realize how silly it is to not let you use the coupon. 3. There is not a limit on coupons you can use at Walmart. After 40 coupons the register will beep and a CSM will just need to turn the key, but that doesn’t mean you can’t use more then 40 coupons! 4. In the Walmart coupon policy it is clear that they allow overage in the form of cash back. That is why you carry the coupon policy with you. Walmart is reimbursed 100% for the coupon. If you have problems you need to call 1-800-Walmart and ask them to help you fix it. I was not planning on doing this post… But I hear this all day long every day. I am a firm believer in following the coupon policy and letting mangers make decisions for their own stores. 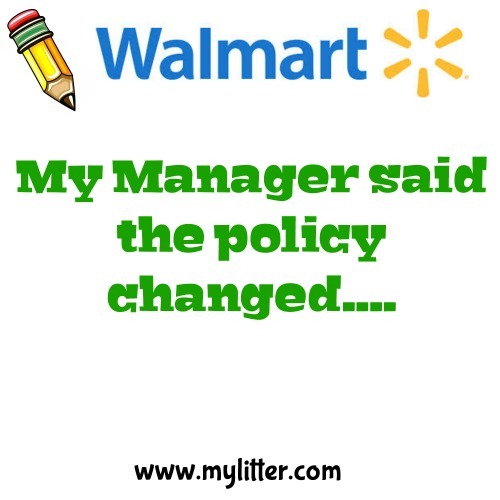 HOWEVER, Walmart seems to have some issues with managers and cashiers claiming that there is a “new” coupon policy. This is often said when they are unsure of the current policy or want an excuse to not accept a coupon, issue that you might have. BUT when pressed, they can’t produce a new coupon policy or even the current one at all. The Walmart policy does NOT state that you can not use a coupon on a price match item. If you explain to the cashier or manager what I explained in the LAST POST, they usually see the light and let you do both. If they don’t I would call 1-800-Walmart often until they fix that. 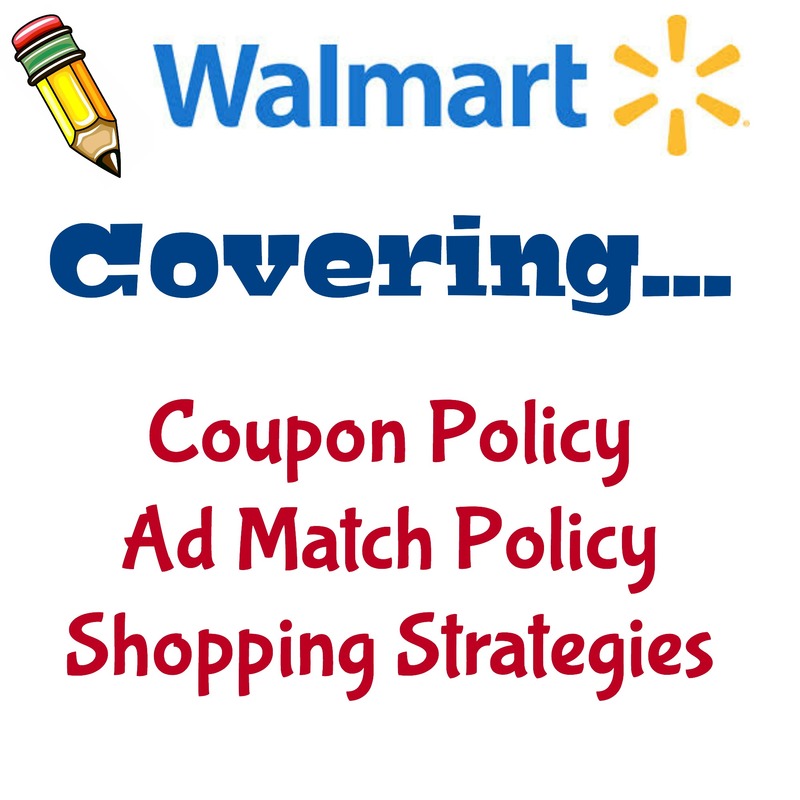 Also, I would suggest calling 1-800-Walmart to ask them if they allow coupon + price match. I have called a LOT and each time they have told me that they do. Should they ever come out with a statement, or policy that says they will not do both. Price Matching is dead. There is no point. I love ad/price matching! What an awesome way to save some time and money! 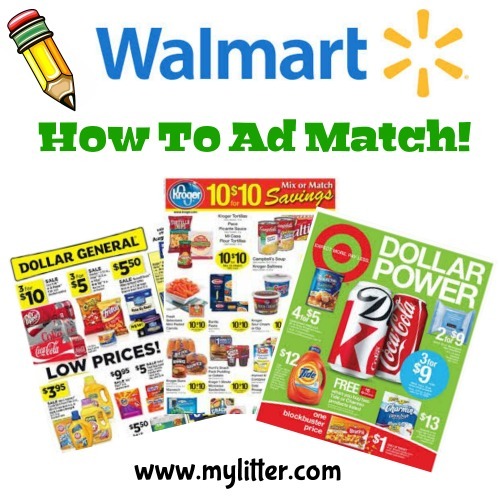 The idea is that you can use the sales ads from the other stores to get the same price on the SAME item at Walmart. The ad match guarantee says you do not have to have your ad with you. I bring mine anyway to avoid any hassle. Paul @iheartthemart has some tips to price match (he also has some good videos on You Tube, you can find him there under “i heart the mart” Paul also does about 20 different stores a week weekly price match lists you can print and take with you to the store. 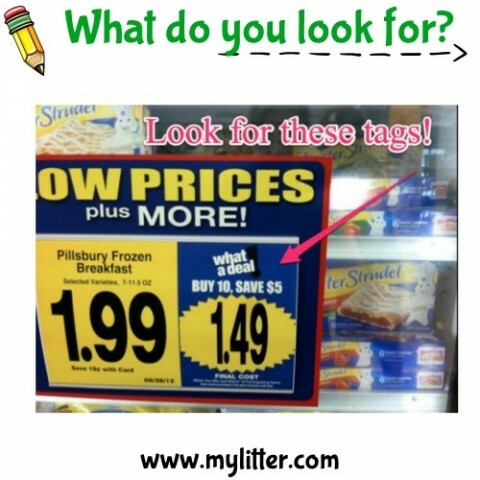 1.Check the other grocery stores sales ad’s for great deals. Make a list of the items and prices. Check to see what coupons you have or can print to match up with these sales. Check electronics, I have saved HUGE this way at Walmart! 2.Take a look at the price matching policy. They will not do B1G1 free sales unless there is a listed price, but they will do 2 for $4 or 2/$4. They will also NOT do % off, like 25% off all soda. Florida’s policy is different on BOGO’s so make sure you look first. 3. Go shopping! Bring your other store ad’s with you. Most will require that you have them. Don’t cut them up, they will need to verify the dates on them. You can only use a current ad. 4. I always place items that I am NOT price matching on the belt first. Then I place my items that I am price matching and lay the ad on top of them so I don’t forget… or get distracted by children! I inform the cashier that I am price matching BEFORE they ring up my items, and show them the ad if needed. I saw a woman once that had placed sticky notes on her items, the cashier LOVED her! I don’t have that kind of time, but it was a good idea! 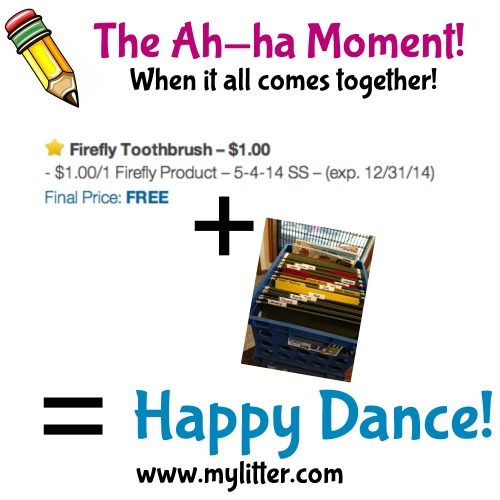 Do the “Happy Dance” that you saved a bunch of money! 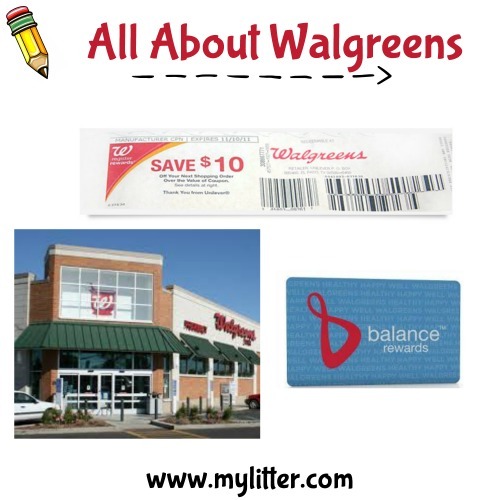 Price matching at Walgreens, CVS and Rite Aid can be confusing at first, but it is easy to get the hang of it. When price matching a store with a customer rewards program you price match the sale price BEFORE the reward. That is because Walmart doesnt have the same program or the ability to print you a RR or a ECB. For example in the razor deal above you would price match the “with card” price of $8.99. 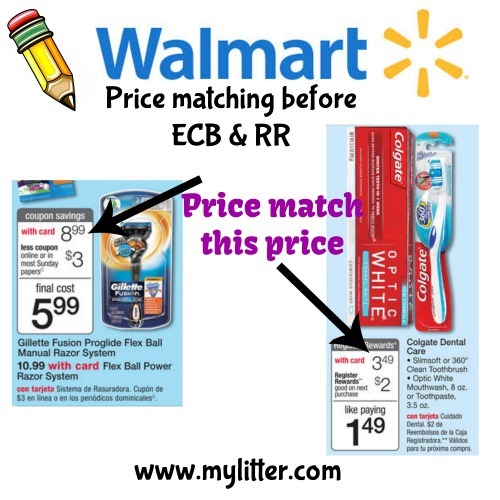 In the toothpaste deal on the right you would price match the $3.49 price. The best question to ask yourself is “what would the OOP price be” that you are paying at the store you are price matching. That is what you are allowed to do at Walmart. The OOP on the toothpaste is $3.49 (minus any coupons you would have) so that is the price you price match. Now, doing that deal at Walgreens you would get back a RR which Walmart can’t print. So some deals are better done at the store that has it in the ad. There is a new app at Walmart that will help you save some money. It was supposed to start August 4th but the Savings Catcher was busting at the seems and actually rolled out August 1st in many areas. What this app does is allow you to scan your receipt and Walmart checks to see if you could have saved any money at your area stores. If you could have it will give you the difference back. I really love this program and what it means for the casual shopper, for coupon and price matching pros like us I think it is a scorecard and a safety net. It is so simple to use and reaches so many stores. When I submitted my receipt from my regular Walmart Savings Catcher said it was comparing prices from 99, yes 99 different stores!! I submitted a receipt from a Walmart a little further south and it had a whopping 103 stores it was checking, WOW that is a lot of stores! I have submitted two receipts and I got a total of $2.23. I was actually really excited about this because I am a price matching fool baby!!! It means I am doing it RIGHT!!! I have put most of the details about Savings Catcher below, I am going to go through a few of my own thoughts and answer a few common questions I am getting. Yes, you can still Ad Match. I wish they would have stated this on Walmart.com You can submit as many as 7 receipts a week 15 a month and get as much as $599 back a year. August 19, 2017 By Tiffany 3 Comments By clicking on our links, we might make a SMALL commission - Thanks for the support! See our full DISCLOSURE here. CVS for me was the VERY first place I ever got anything for free, they were those nasty Soy Joy bars! 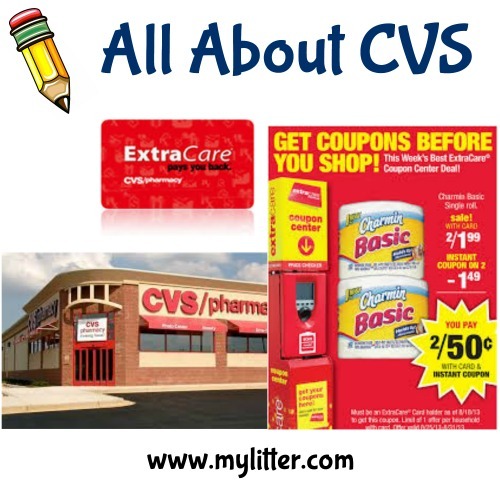 I have such a love for CVS and think it is the easiest drug store to get started couponing at. It is pretty easy to understand and the cashiers are mostly helpful. The very first thing you need to do is have a CVS card. You can get one online or right in the store and use it that day. CVS has a customer rewards program called the Extra Care Bucks or ECB program. They reward you buy giving you ECB’s back on specially marked purchases that you make. ECB’s print out on the bottom of your receipt, they are like cash or a gift card so don’t loose them. ECB’s can not be used on alcohol, tobacco, or on prescriptions. They can be used on everything else in the store. You also earn back 2% quarterly of everything that you spend pre-coupons in the store. The first thing to do when you walk into the store is scan your CVS card at the red box that looks like a price scanner, well, it is also a price scanner. CVS has it’s own store coupons and they will print from there. You want these because they can be combined with manufacturer coupons for an even better deal. 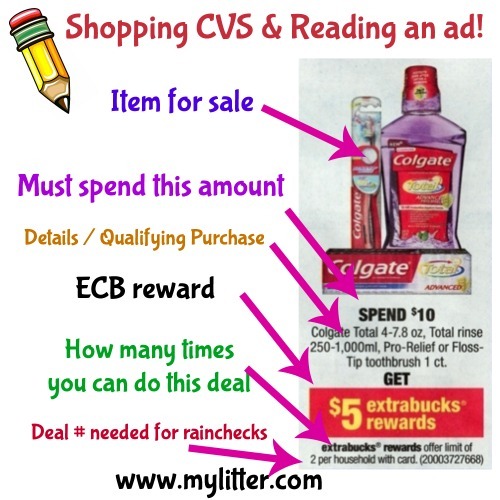 Now you start shopping, take a look at the add and find the items that give you ECB’s back. Then find coupons that can be used along with these sales. OR, check my blog on Saturday mornings and I do the match-ups for you! There are limits on the deals so pay attention to that, or you won’t get the ECB’s back if you buy too many. You also can not use another persons ECB’s on your purchases, they are tied to your card only. The bottom of your receipt will keep track of your purchases and your limits for you. To make the most of your trip you will want to make a few transactions. Yes, you will actually place sometimes on the counter, pay for them and then right then do another transaction. I will either tell them I am making multiple transactions, or if it is busy I will go tot the back of the line and wait my turn again. The reason that I am doing this is because I am “rolling” my ECB’s onto the next purchase to help pay for part of it. In the instance above, you’ll spend $2.49 plus tax out of pocket, if you have the coupon. After you checkout, an ECB for $2 will be on the bottom of your receipt that you can use on your next order. Now, since this is only a limit of 1, you cannot buy this deal again and have the ECBs print out. CVS is really fun to shop at when you get the hang of it! Don’t give up and start small. The very first time you go just purchase 1 thing that gives you ECB’s back. Then try a little more the next week. You need to get to 98% of the value of the item to get the ECB, for example if you are at $19.95 and you had to get to $20 to get a $5 ECB you would get the ECB because you were at more then 98%. If you were at $19, you would NOT get the $5 ECB without spending a little more money. 2 coupons can be used on a BOGO sale. Sign up for the CVS newsletter and get a $4/20 coupon. Sign up for the CVS Beauty Program you will get: 10% off beauty pass, $5 ECB for every $50 you spend BEFORE coupons, $3 ECB on your birthday, Free to join, get exclusive coupons first! ALWAYS ask for rain checks if the item you want is sold out! At Walgreens I have scored some AMAZING deals. But to be honest it can be a little more than frustrating and CVS is much easier. 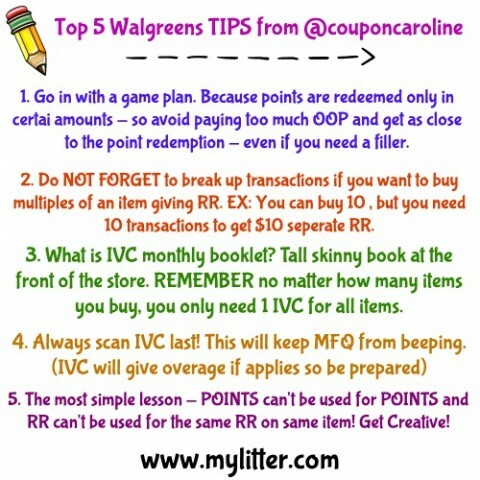 If you are new I always suggest starting at CVS and once you have the hang of that, then try Walgreens. BUT, I have a ton of friends and readers who score AWESOME hauls at Walgreens! You will need to sign up and create an account to get your card. This will be needed to track your points and to redeem them. 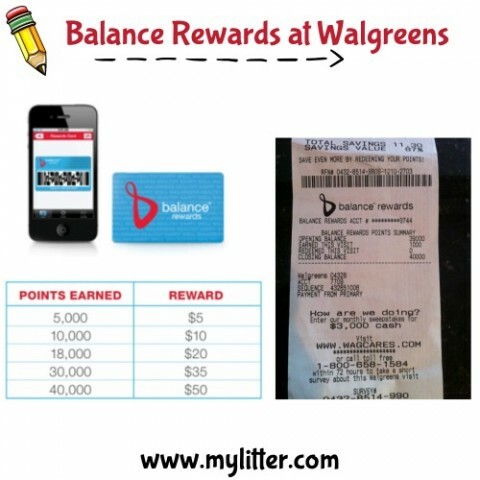 Customers can join in one easy step in stores at checkout or any photo kiosk, online at walgreens.com/balance or with their mobile devices and begin earning points immediately for their purchases. Members receive exclusive savings every week on popular products. Savings and points can be easily earned when members show their Balance Rewards card, provide their telephone number or scan their mobile phone. Members can easily access their point totals and see how many points they need until their next reward at checkout, online or through their mobile device. Just be sure to redeem Balance Rewards points on a transaction where you are not expecting to earn more BR points. When you buy an item at Walgreens where you earn points, those points show up immediately on the bottom of the receipt from that transaction. Look for “earned this visit”. Members receive exclusive access to the Walgreens online Pharmacy Chat service, 24 hours a day, 7 days a week, 365 days a year. Members can redeem points immediately in-store or online for a little something special or hold off until they have earned more points for an even greater reward. Points will not expire as long as members remain active by shopping at Walgreens at least once every six months and redeem their points within three years. If you were expecting points but didn’t earn them, ask the cashier immediately. If you bought the wrong size, color, flavor, or fragrance of the item and therefore didn’t earn the points you can return the item and purchase the correct one. For me there is a LOT to learn at Walgreens. Make sure to use Google, You Tube and follow awesome Walgreens people like @couponcaroline (on Instagram) for help! < ——- Follow her! Couponing with a buddy is the easiest way to get good and understand the rules. Ask questions, but the more work you do yourself the better you will understand it and the faster you will get the best deals! 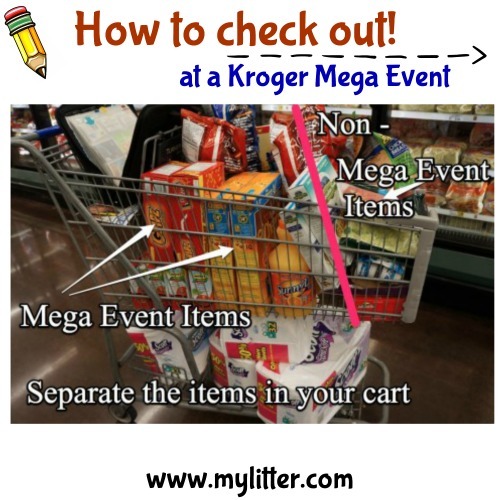 Because we have an AWESOME Kroger Mega Event coming up tomorrow, I think we need to make sure that everyone knows how to shop a mega event sale! FIRST – I have a 30 minute You Tube Video that you can watch which will teach you everything you need to know. Just go to You Tube and search for “MyLitter Kroger Mega Event” and you will find it. When you are having a mega event you will want to check out the ad for your region on Kroger.com and wwww.mylitter.com so you can see the deals for YOUR region. This is the front page of an ad for a mega event above. It will explain what items are on sale ( although there are a TON more in the store unadvertised) and tell you what your final price will be AFTER the mega event $$ came off at the end. It will also tell you how many items you need to buy to get a discount. A mega event sale is unusual because it runs for 2 weeks instead of 1. Like I said, MOST of the mega event items are unadvertised and not in the ad. So when you are in the store you will want to look for all the mega event items that are tagged like the image above. 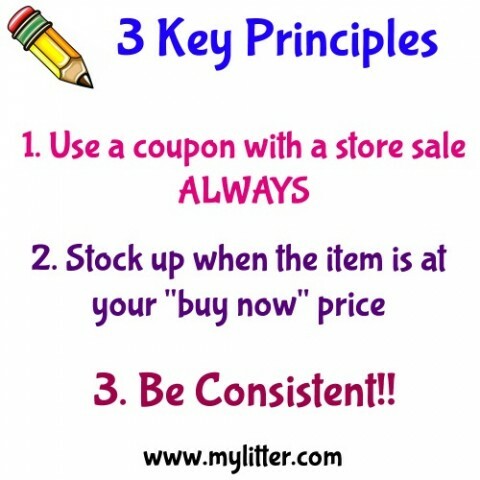 On www.mylitter.com I also keep a HUGE list of the unadvertised items and match them up with coupons. 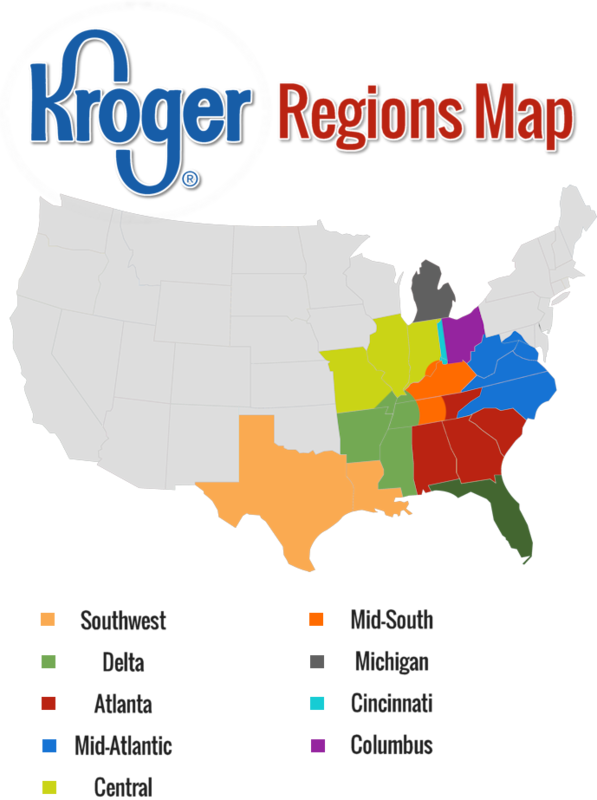 Just look in the “nav” bar for your region under “All Things Kroger” to find your list. The first price is the price you will pay if you don’t buy 5 mega event items. The lower price is the price you will pay (before coupons) IF you buy 5 mega event items. During this sale you MUST buy the number stated. For example, in the sale above it is a Buy 10 Save $5. If I buy 19 mega event items I will only get $5 off, but if I had bought 20 I would have gotten $10 off. I separate the items in my cart by non- mega event items and mega event items so that I can keep track of how many I have. This trip I had 30. I also double count them when I am checking out. The $5 for each 10 items you buy will automatically come off your total when you scan your Kroger card and check out at the register. You can also check your receipt and make sure that you get all the money off that you are supposed to by looking for a <* by each item. Sometimes if I notice I am short an item or 2, I will ask the cashier to scan a cheaper item 2 times and I will run back and get that item after checkout. This is so that I can get all the money off I am supposed to. There is nothing you have to do to make the money come off from a mega event other then scan you Kroger card or put in your phone number. You can also use coupons on the items you are buying in the mega event. There is usually no limit on how many mega event items you can get in a transaction. Coupons for the troops! Our Men and Women overseas in the military are able to sue coupons 6 months past the expiration dates. So, if you have ever wondered what to do with those expired coupons, you can send them over! This is one small way that we can help our military families. August 18, 2017 By Tiffany 3 Comments By clicking on our links, we might make a SMALL commission - Thanks for the support! See our full DISCLOSURE here. Ok… today we will be talking about grocery stores. Knowing what affiliate stores your grocery store is associated with is super important! I have a favorite blog that I followed when I first started couponing. I almost quit following them because she always posted deals for King Soopers and Dominick’s. I loved her other deals but I needed someone who had deals for stores in my area. Then one day I realized that many stores are affiliates of 1 main store or company! I also realized that although she was posting King Soopers deals, there were really the same as my Kroger deals! Take a look at the images above, those are all Kroger affiliate stores. You might have 1 of those stores but can look at the ad for any of the other stores and see the same deals. These images illustrate all the Safeway affiliate stores. I have Randalls here in Houston, Dallas has Tom Thumb and so on. Also, some regions ads come out on Sunday with a new ad and some are Wednesday. For example, Safeway ads usually come out on Sunday, my Randalls new ad comes out on Wednesday, so from Wednesday to Saturday we have the same ad. We don’t possibly have time to break down all the grocery stores individually. So today I am going to talk about Kroger because it is the LARGEST grocer in the world. Plus, many of you either have a Kroger or you have an affiliate store. EVEN if you do NOT have any, please read this info because it will probably apply to your stores as well. At Kroger you need a Kroger card. This card will let you double and triple your coupons, gets you the sale prices on items and allows you to load digital coupons to your card. Kroger stores in Texas do NOT double or triple coupons and other regions around the country are discontinuing double and triples as well, but some areas still allow it. Please refer to your local ad and policy for more information about your region. Check the Kroger flyer for sales and the weekly ads. Ads vary by region just like the double and triple coupon policy. 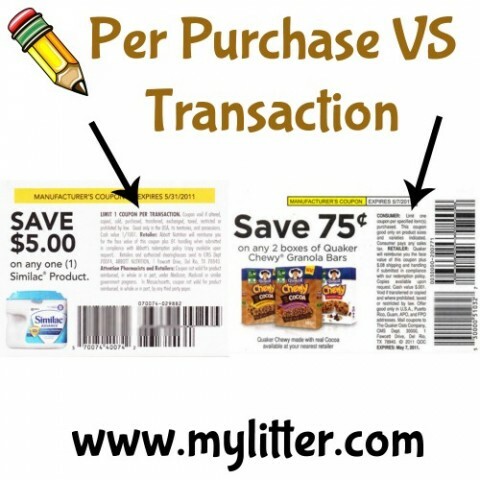 Kroger Deals are posted here on MyLitter each Wednesday for 5 different regions. 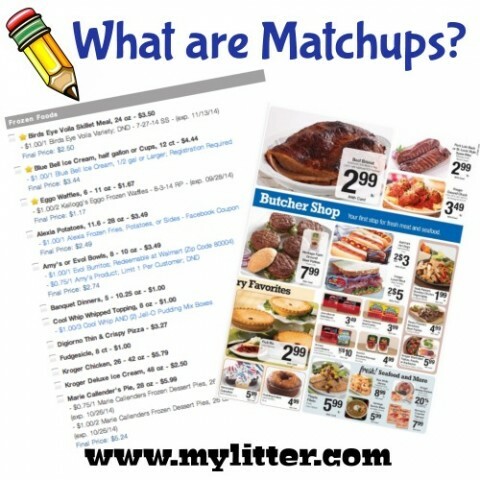 Then you will make a grocery list with the store match ups like we talked about on Day 2. Kroger accepts digital (e-coupons) from the Kroger.com site, they also have an app that you can download to your phone. These coupons are manufacturer coupons and do not double or triple. They also can not be combined with paper manufacturer coupons and are one time use. UNLESS you CLEARLY see where it says 5x use, which is rare. Kroger accepts manufacturer coupons (and as stated above, sometimes doubles or triples them). They accept manufacturer coupons from the Sunday inserts, other advertisements and printed from the internet. In areas that double or triple you will want to verify the limits as well. Every other month or so Kroger offers a promotion called Mix and Match or a Mega Event Sale. They also usually combine these with a 10 for $10 sale. During the mix and match or mega event they offer money back or off instantly when you check out. For example: Mix & Match 10 items, Get $5.00 off instantly at checkout – so when you buy 10 items listed in the Mix & Match you get an additional $0.50 off each item. If you buy less than 10, you don’t get the additional savings. Kroger runs and participates in Catalina offers. These are promotions that give you a coupon for savings on your next shopping order when you buy specific items. You can see the current list of catalinas HERE. Purchase amounts and quantities are figured BEFORE manufacturer coupons are applied to your order. National Catalina offers will roll at Kroger stores – you can buy the deal and receive the coupon in a single transaction and then turn around and use the Catalina coupon from the first transaction to pay for a second one and it will produce the coupon offer again. August 17, 2017 By Tiffany Leave a Comment By clicking on our links, we might make a SMALL commission - Thanks for the support! See our full DISCLOSURE here. Ohhh, today should be fun, because yesterday you got it all figured out right? You are a mad organized couponer, with all your coupons and shopping list ready to go! You kill it at the grocery store and now you are starting your stockpile! You can check out Day 1 HERE – Day 2 HERE – Day 3 HERE. Stockpiles are cool. We call ours the Ivanovksy Mini Mart. It saves me thousands of dollars a year by having one. 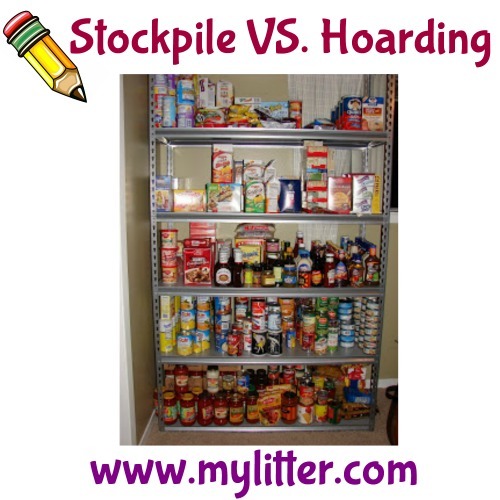 Why have a stockpile? 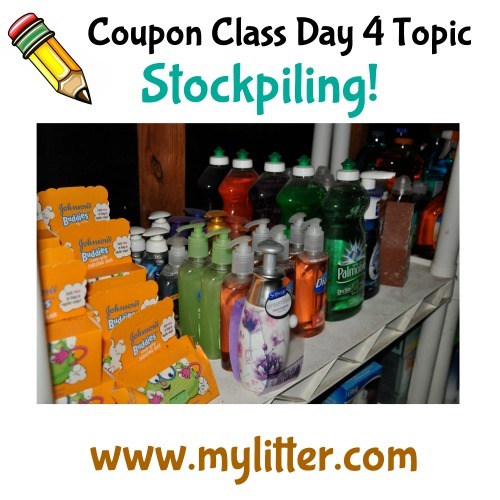 You have a stockpile of items you bought at the lowest possible price, we talked about this the very first day, and you STOCKED up on them so you don’t have to buy them again until they are at that lowest price again. This will save you a LOT of money. Our stockpile has come in handy a few times for a few different reasons. My husband was laid off from his job for an extended amount of time, we basically lived off our stockpile for about 9 months. During that time I didn’t buy ANYTHING. NOTHING. I couldn’t. Whatever we already had, I had to make due with. I thought it was a 3 month supply, but you would be surprised what you can make work and stretch if you have to. Having a stockpile was invaluable for us, and I will never go without one ever. I believe in being prepared. I have also made last minute gift baskets from my stockpile, supplied sleepover guests with missing toiletries and “paid” my siblings to babysit by letting them go “shopping” in my mini mart! When you live in the south, unfortunately you do not have a basement, attic or garage that you can keep food or stockpile items in. You have to be creative and organized in the ways that you can store items. A friend of mine asked me to post what I store in my garage. I am NOT an expert on this at all, it is mostly trial and error. Who knew deoderant would melt?? Well, I do now! It was also nicely pointed out to me by a friend that I was killing my batteries by keeping them in the hot garage. Also, there is the issue of the cement, the chemiclas from it will leach into your food products so you have to store everything up off the ground. This also goes for anything you are storing water/liquid in. Do not store your food or other products near gasoline, insecticides or other chemicals. The plastic that these chemicals are stored in is porous and can leach into your food and products also. These items should be in a separate cabinet on the other side of the garage. Most people have the same problems with garage storage. Either your summers are too hot or the winters are too cold. I am not sure there is a perfect climate for all year long non-climate controlled garage storage. Food, canned or boxed or otherwise! 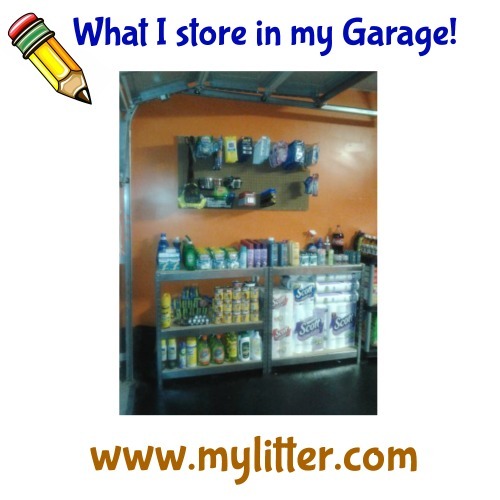 What do you store in your garage or outside? Couponers are some of the most generous people out there! I have made a plea a few times for stockpile donations from the devastation in Haiti to the tornados in Oklahoma and you guys come through EVERY TIME! One of my friends @couponsammie has probably donated over $1,000 in items from her personal stockpile in the past 2 years to different causes and situations that needed the help! Something we do is keep “Hygiene Kits” in our vehicles at all times. 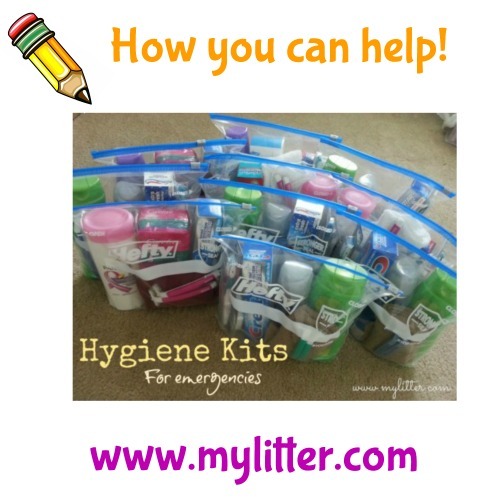 These are kits that are put together and donated to various organizations when there is a disaster. We keep them in our cars because when there is someone asking for money on the corner, we hand them a kit (we add Walmart gift cards to these) instead of cash. I have never been refused. I am sure there are 100’s of things you can add! Will you use it? If the answer is no, you probably don’t want to stockpile it in your house (buying a few on a good deal to donate, that’s a different story). How much of it will you use? Be realistic. A family of 9 will use more of most things than a family of 4. How fast will the item go bad? Fresh items, not so long – HBA items, can be good for several years. Where will you put it? There’s a fine line between a stockpile and a monster that takes on a life of it’s own. 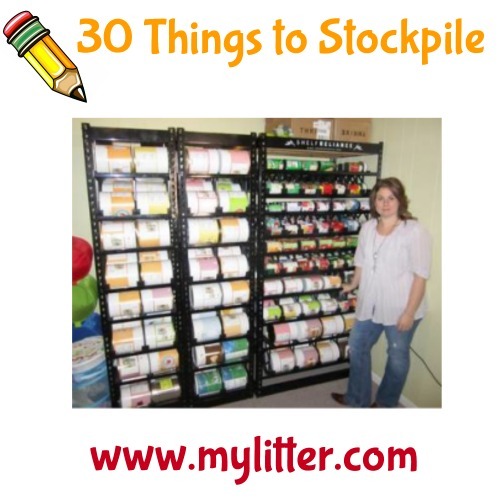 Having an organization system and a plan will help you make the most of your time and money when stockpiling. Is it a good price? The point of having a stockpile is to save money. Get items on sale and with coupons when you can get them at rock bottom prices and avoid having to pay retail for them later or in bulk online from places like Amazon.com. Peanut Butter – It usually has a good 1 1/2 years date on it and it’s a great source of protein. Canned Fruit and Veggies – Yes, fresh is better, but canned options are better than going without. Boxed Pasta – Lasts like what seems like forever! Canned/Jarred Sauces – Tomato based sauces also make a good “veggie” serving. Canned Meat – Tuna – Shelf life is long and it’s a great protein source. Boxed Potatoes and Rice – They make great sides in a hurry and have a great shelf life. Cereal/Oatmeal – Cereal can often be purchased for as low as $.50 and other deals have made it free. Usually pretty good shelf dates on cereal. Dressing – Mayo, mustard, ranch, bbq. Pretty long shelf life on many, but keep an eye on those dates, egg and dairy based items have much shorter dates. Cheese – Chunk or Shreds, you can freeze both. Then, when ready to use, pull out and thaw in fridge in a day or about an hour on the counter for shredded. Just know that chunk cheese will crumble after it thaws, it won’t make pretty cracker cuts. Can you have too much of a good thing? Sure you can! When you first start couponing, there is a little bit of the “honeymoon phase” You are freaking out at all the great deals you can get and free stuff you find. You are running around all day trying to find those last free bottles of body wash even though you already have 50. But it is a TON of fun, and why not, it is free!! OR IS IT? Take into consideration the cost of gas, coupons and most important your time. Because every sale and coupon is cyclical, you are going to see the SAME sale and coupons again! There is no need to kill yourself to try and get every last toothbrush at the expense of your time and even family. Plus, where are you going to store it? We have 9 people in our family. We have 7 kids ages 16 – 4. We go through a LOT of stuff! HOWEVER, I don’t have a room dedicated to my stockpile, I don’t need it. I have a pretty decent stockpile, that many would love to have, and you really can’t even see it! How long will it keep? How many will WE use in 3 months? Do I have room for it? I have seen a few strained marriages over a thoughtful couponer, who is really just trying to help her family, but let’s it take over her house and life. August 16, 2017 By Tiffany Leave a Comment By clicking on our links, we might make a SMALL commission - Thanks for the support! See our full DISCLOSURE here. You can check out Day 1 HERE and Day 2 HERE. Today might be the MOST important day in this class. PAY ATTENTION today! Re-read everything a few times and ask questions if you don’t understand, because today I am going to show you how it all comes together. Are you ready? Did you get your homework done from last night?? We will be discussing how to organize your coupons. It is essential to organize your coupons in a way that you will be able to find them or you will not be successful couponing. There are ton of different methods, you need to find one that works for you. 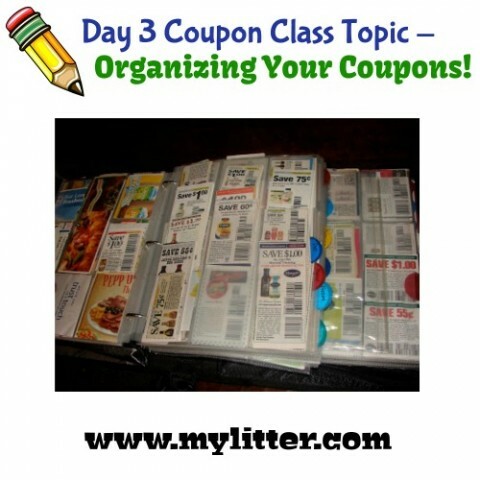 When I first started couponing the most popular way to organize your coupons was with the coupon binder. Today I’m going to teach you a different method because we have found over the years that when people are first starting to coupon, doing a coupon binder can be overwhelming. So I’m going to teach you a way that allows you to only spend 15 minutes a week putting your coupons away so that you can be successful and start seeing some savings quickly!!! I know I just said I’m going to teach you how to not use a coupon binder, but we need to talk about it for the people that are currently using it or want to give it a try! A coupon binder is typically a three ring binder that you use baseball card pages to hold coupons that you have cut out and file them away. 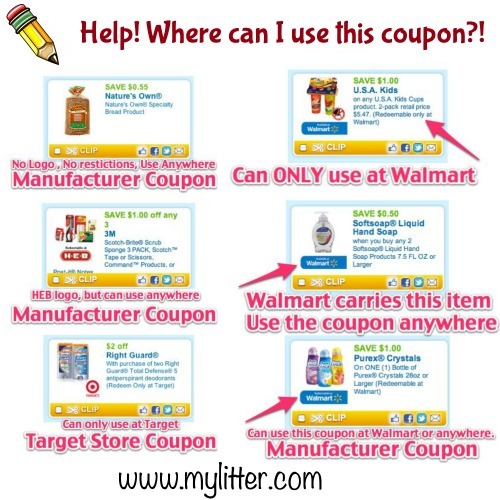 This is a great method because it allows you to see all of your coupons at once. Typically you sort them by categories or aisles of the grocery store. 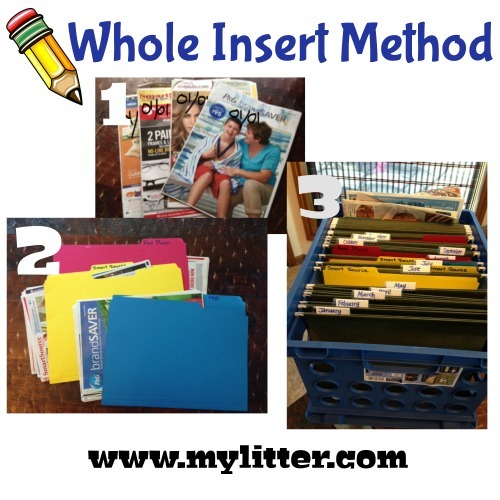 I have used this method for many years and I love it but it is very time-consuming and can be overwhelming to try to get all of your coupons sorted and cut each week. The advantage is that you can quickly locate every coupon and that you have all of your coupons with you when you are in the store. Some of the best deals I have ever gotten have been unexpected or unplanned and I was able to take advantage of them because I had all of my coupons with me. 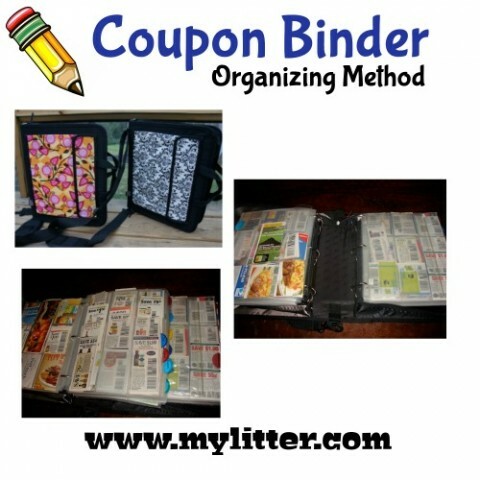 Over on MyLitter.com I have a very detailed post with helpful links on how to organize a coupon binder, complete with printable sheets for each of your categories and a video on how I organized mine. Each week when you get your Sunday coupon inserts out of your Sunday paper, you will write the date you got the insert on the front of the insert. If you forget, your back up plan is the small date typed on the spine of the insert. Then you will sort your insert by Red Plum, Smart Source and if you get the P&G that week, put them all together with the same inserts. This is how I do MINE. You can find a way to do yours that is different, no big deal. You just want to basically file them away all together where you can find them. First – You need to get something that can hold hanging file folders. I am guessing you already have something at home or have a drawer in a desk that can do this. If not, Walmart has the box I use for only $3.50. Third – You need about 20 hanging file folders and about 30 regular file folders, I am assuming you probably have these as well at home. If not, Walmart has them cheap. On the regular folders write Red Plum on one, Smart Source on one and P&G on another for each month. Inside the hanging file folders you are going to place the regular folders with each marked with Red Plum, Smart Source or P&G . Then you will place your whole inserts in the file folder that corresponds with the insert AND you have the Sunday date written on them that is the same as the date on the insert. In the back of your filling system you can keep your grocery ads, extra coupons, printable coupons, etc. NOW…. You have your coupons filed away. How do you make this work for you? Most grocery stores ads change on Wednesday, that is the day the new sale starts. Some grocery stores start other days, just google your local stores. Many people shop this day because there is a new sale. When you go doesn’t really matter, do what is best for your family. Each week when those store ads come out, I take the grocery store ad and type it all up in a spreadsheet. Then I match up all the available coupons with those on sale items. This is called a matchup. Remember how we talked about buying an item on sale and using a coupon with it? Now this is where I do the work for you…. I TELL YOU WHAT ITEMS ARE THE BEST DEALS…. The items that have a STAR by them are things you will want to stock up on that week. They are the BUY NOW items. The best price items. Because each week you are stocking up on the things that are on sale, and you are combining a coupon with it, to get the BEST POSSIBLE PRICE!! It would be hard to keep track of all the sale cycles in the store yourself and many people struggle with knowing is something is a good price or not, and should they stock up on it. I am doing that work for you! Go to www.mylitter.com in the top in the navigation bar click on the STORE LOGO or the box on the far left that says “click for all store deals” of the store you are interested in shopping at. I do the match ups for about 20 different stores. If you have a small grocery store you might have to use Google to find someone who does the match ups for your specific store. 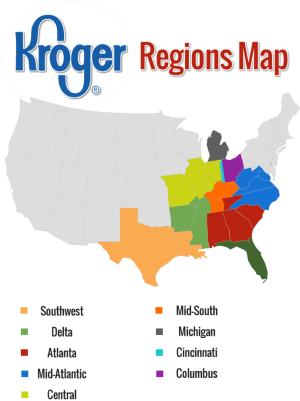 Kroger – Which is also Ralph’s, Fry’s etc. Then you will want to look for the weekly matchup for that store. In the match ups you will find all the items in the current ad that are on sale, plus unadvertised deals that we have a chance to add in. 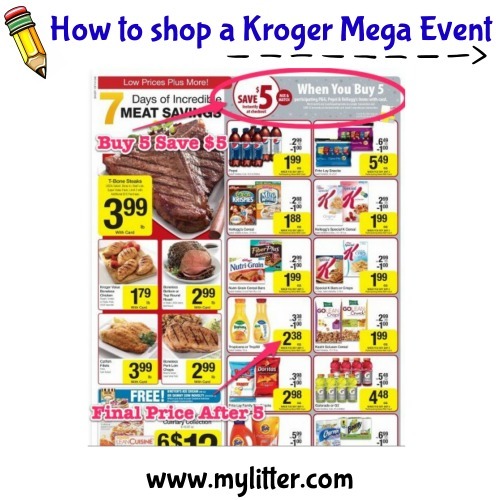 If there is a Kroger mega event you will find EVERY unadvertised deal added. Then you will see under each item a coupon listed IF there is a coupon available. There might be a few coupons listed. This does NOT mean you can use all those coupons on the 1 item, I am just giving you ALL the options of available coupons! Because you might have 1 coupon but not another, so i am listing them all. If the coupon is listed in blue and you can click on it… it is either a printable coupon OR a digital coupon you can load to your card. If there is the option to “stack” a coupon, I will list those options as well. Then to add the item to a grocery list, you can click the box next to it and your list will pop up. This will allow you to email your shopping list to yourself or text it, so that you have it in the store. You can also add your own items to the list or make notes. Now for the exciting part! Check back in a minute! Ok here we are… This is probably the MOST IMPORTANT post you are going to read… HOW DOES THIS ALL COME TOGETHER??!!! Now you are going to the store…. In the matchup you see FireFly toothbrushes and want to get some. You read the matchup and it tells you there is a $1 off 1 Firefly coupon in the 5-4-14 SS (which is the May 4th Smart Source insert) you go to your filed inserts and flip to the MAY section, then you pull out the May 4 Smart Source insert (because you wrote the date on the front) and THEN YOU CUT out the Firefly coupons!!! Did you see how easy that was? 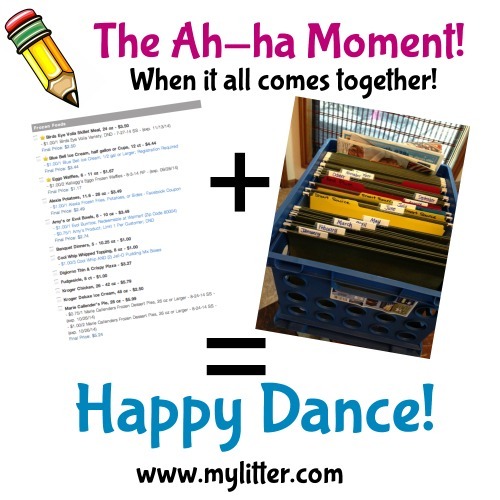 Can we all have an ah-ha moment together?! You stick your coupons in a plastic baggie, or accordion little file, or your pocket, or wherever and you go to the store and get YOUR FREE FIREFLY toothbrushes!!! Easy peasy!!! So much easier then cutting all your coupons for hours and trying to file them away. If you are NEW it is SOOOO much easier to start this way! I hope today was helpful for you! Things should really start coming together for you as far as organizing and figuring out what you need to be doing and buying! Check back tomorrow for Day 4! Coupon Class Day 2 – All about coupons! August 15, 2017 By Tiffany Leave a Comment By clicking on our links, we might make a SMALL commission - Thanks for the support! See our full DISCLOSURE here. Wow! Did you get your homework done? Did you scout out where you can store your stockpile and take inventory of your coupons? Did you print off your favorite grocery stores coupon policy? GOOD! Hang on, because today is going to be BIG! 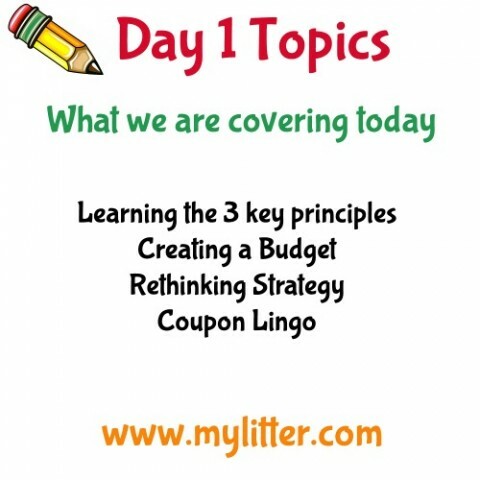 We are going to be talking about coupons themselves, and it is going to be packed full of info! If you need to go back and see yesterdays class, you can GO HERE. Also, if you want to PRINT this post to have as your notes, go to the bottom of the post and click “Print Post” which will allow you to have a copy! 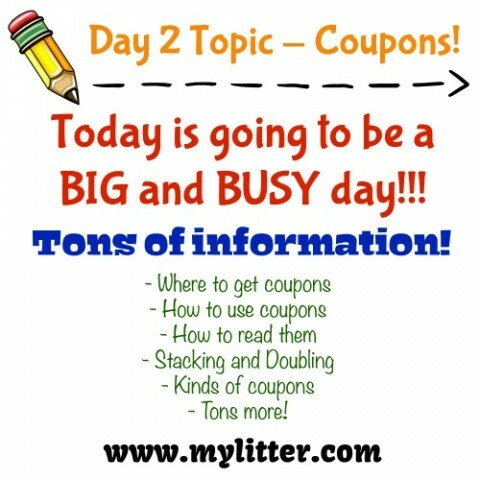 Today is going to be packed full like I said about all the things you have ever wanted to know about coupons, when and where to use them and how to read them and so much more. Please feel free to ask questions in the comments and we will get them answered. Remember that GOOGLE is also your BEST FRIEND. I will quickly tell you that when I first started there wasn’t Instagram and Facebook groups to help you get going. I had to GOOGLE EVERYTHING. I also had to ask TONS of questions at my store and find a friend to coupon with. The more questions you ask and research you do on your own the more successful couponer you will be! The WORDING on a coupon is MOST important. You can almost completely ignore the picture. READ What the coupons says, you go by what the coupons SAYS not what the picture is. Dole can not possibly put a picture of every canned item they make on a coupon, so if it says “any canned fruit” it means ANY canned fruit even if there is only a picture of pineapple on the front. You can use 1 manufacturer coupon per item you are purchasing. Types of coupon – The Most popular coupons you will see are manufacturer coupons. These are found in the Sunday coupon inserts you get in your Sunday paper, they are found in magazines, on and in cereal boxes, in the grocery stores, just about everywhere! You will know it is a manufacturer coupon because IT SAYS IT AT THE TOP! This means the manufacturer has out this coupon out as part of a marketing campaign. They want you to use the coupon, to love their product and to buy the product again and again even without a coupon. Who does that?! 🙂 All manufacturer coupons, will say “manufacturer coupon” or some abbreviation of “manufacturer” somewhere on the coupon. 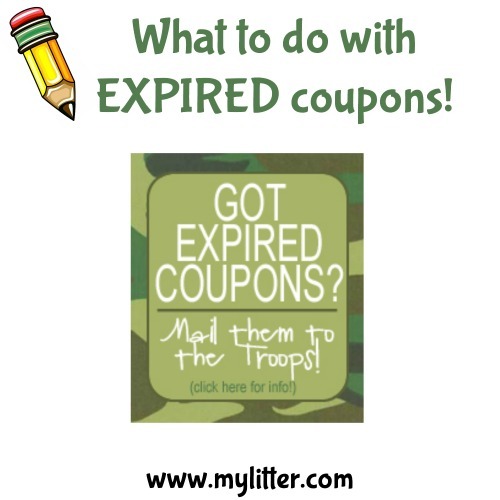 Expiration Date – About 99% of coupons will have an expiration date. Does anyone remember the old coupons with no expiration dates?? This is the date the coupon MUST be used by. Some (very few) stores will take expired coupons, you will need to ask your store. Value of the coupon – This is the amount you will be getting off your purchase. It is how much the coupon is worth. How many you must buy – This lets you know how many items you must purchase to get the dollar/cents amount off your purchase. If it says “2” then you need to purchase 2. GS1 Barcode – The newer longer barcodes that were developed to help prevent coupon fraud. Scannable Barcode – The barcode tells the store a lot of things like what you are required to purchase to use the coupon. Barcodes typically start with a 5 or a 9. If there is barcode you might have a store coupon, but you must have a readable instact barcode to use the coupon. Retailer Terms – The retailer terms let the store know where to send this coupon to get reimbursed the full face value PLUS a $.08 – $.25 handing fee! Stores MAKE MONEY when you use a coupon. Consumer Terms – Let’s YOU the consumer know how many items you must buy and any exclusions to the coupon. Item Image – This is NOT what you go by when reading the coupon. This is just to help you identify what product you are looking for. This is a lot to read. But it is YOUR JOB to understand what all is involved on a coupon and how to read it. 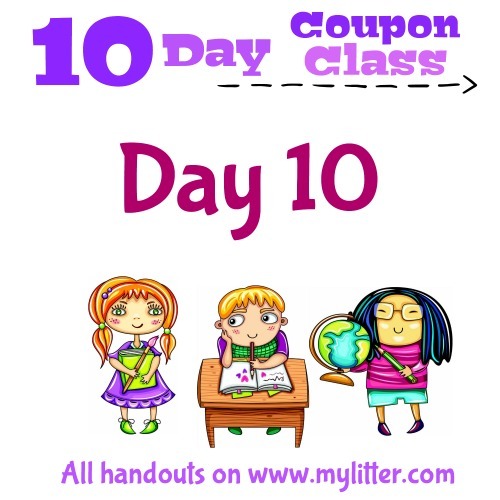 The next type of coupon we are going to be looking at is a “store coupon” You will know it is a store coupon because it will say at the top the name of the store and not manufacturer. Store coupons can often be found at Target, Walgreens, CVS, Safeway stores and many more. I love store coupons because when you have a store coupon and a manufacturer coupon for the SAME product you can use 2 coupons on 1 item! 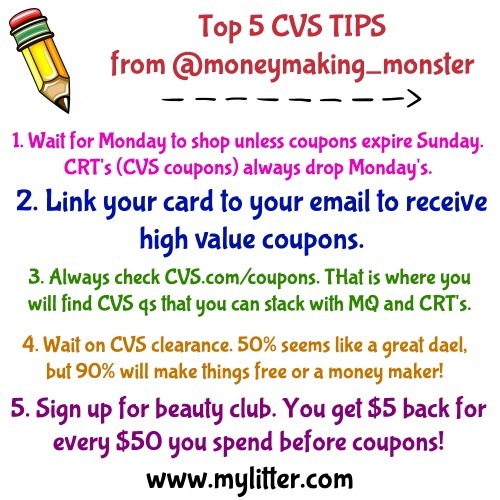 This helps you create a perfect storm in couponing where you can get many really discounted items. 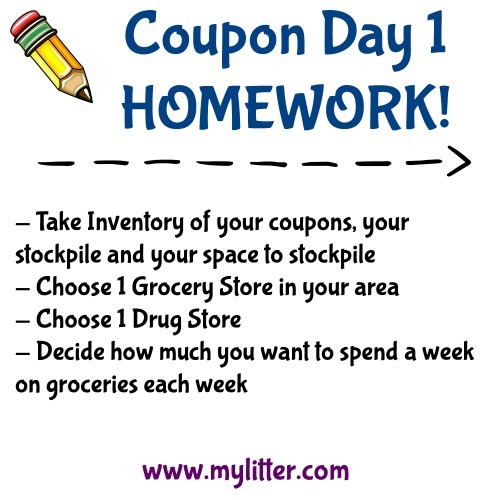 With store coupons the STORE is “reimbursing” the store for the coupon and not the manufacturer (in most cases) this is why you can “stack” a manufacturer coupon and a store coupon together. A store coupon will have many of the same features as a manufacturer coupon, like a barcode, expiration date, terms and conditions etc. This is where YOU, as a smart and savvy couponer have the chance to explain to the cashier the difference between ONE PER PURCHASE AND ONE PER TRANSACTION. Per Purchase: This is referring to the number of coupons that you can use on items you are PURCHASING in that transaction. If you are purchasing 4 items you must have 4 coupons to purchase them. This should NOT be confused with transaction. It also does NOT limit you to using 1 coupon in total. For example, you might purchase 20 items in a transaction, you can use 20 coupons that say “limit 1 per purchase” as you are PURCHASING 20 in that transaction. But if it says “limit 1 per transaction” you can buy as many of those items as you want in that transaction but you can only use 1 like coupon. FIRST look at the top of the coupon to see if it is a manufacturer coupon or a store coupon. 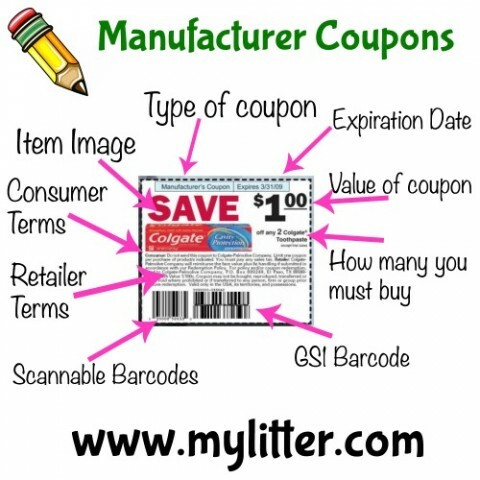 A manufacturer coupon can be used at ANY store as long as there as no exclusions listed on the coupon. A store logo isn’t an exclusion. UNLESS IN THE STORES COUPON POLICY THEY SPECIFICALLY SAY THEY DONT TAKE THEM. Even with another stores logo the store can still redeem it and get reimbursed for it. What you need to do is read the coupon! Clear as mud right?! It really isn’t that hard. The best thing to do is just print the coupon and read it all the way through! 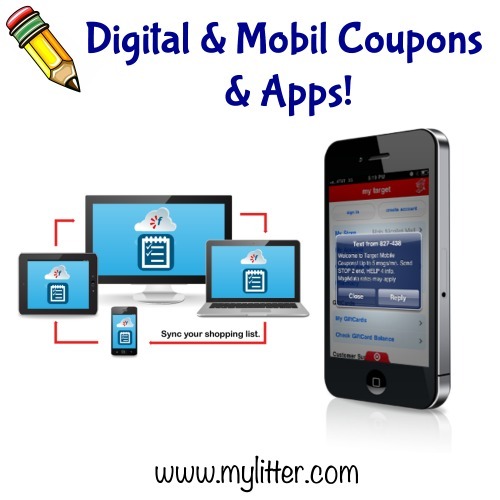 Digital & Mobil coupon use is on the rise! So many sites and companies have digital coupons. Most of the time you will need to download that stores app to use the coupons. Once you have “loaded” them to your store card they can be redeemed by either scanning your store card or letting the cashier scan the barcode on your phone. 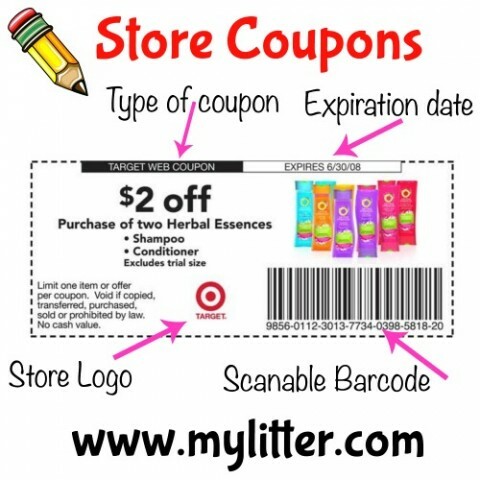 Digital coupons can be either manufacturer coupons or store coupons. Each store is different, so you will need to contact the store to find out. Digital coupons can NOT be stacked with manufacturer coupons. They can expire. You also usually can only use them 1 time. There are exceptions to this rule, again, it might depend on the store or the specific sale. Stacking coupons and doubling coupons are terms that you MUST know. You also need to know which one is which or things could get a little messy for you! Everyone gets a little wrapped up in the doubling coupons, they thing that is the only way they can save the BIG money. While it really does help, it isn’t the only way and just because your area doesn’t double doesnt mean you can save BIG money! Doubling Coupons – Doubling coupons only happens at stores that offer this promotion. You will need to check with YOUR local stores to see which ones participate. What typically happens is that any coupon $.39 and under will TRIPLE in face value. Coupons that are $.40 – $.50 typically double in face value. What this means is that a $.50 coupon actually should be looked at as a $1 off coupon, because the value doubled. It doesn’t mean that you are using more then 1 coupon on an item, it means the value of that coupon increased. Stacking Coupons – This is when you use BOTH a manufacturer coupon and a store coupon on the same product. You are STACKING coupons. For example in the picture above you can see we used both a manufacturer coupon for Un-Stopables and a Store coupon for Un-Stopables getting $3 off 1 bottle! Stacking coupons can only happen at a store that offers store coupons. Typically stores that double coupons are higher priced stores. The “doubling” is a promotion that the store offers and the store actually pays the double amount. The brand still reimburses the store the face value of the coupon. Since so many stores are different in each area you need to call and ask your specific store their rules or look up the coupon policy online. 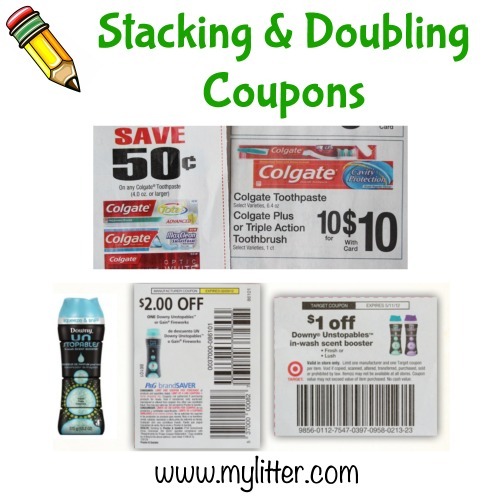 Thanks to Favado for the doubling and stacking coupon examples! 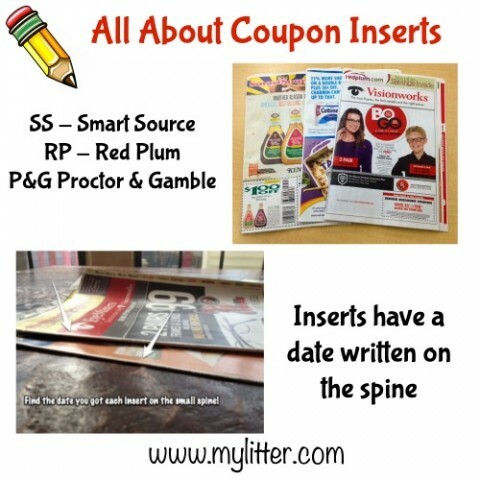 Each Sunday in your Sunday paper there are “coupon inserts” typically there are 2 and they are the Smart Source or SS insert and the Red Plum or RP insert. Then 13-14 times a year we will get the P&G insert which stands for Proctor & Gamble. There on rare occasion might also be the GM or General Mills insert and a few times a year a Target store coupon insert that is usually regional. ALERT! on Holiday weekend there are usually NO inserts in your paper! Coupons have to take a break as well! 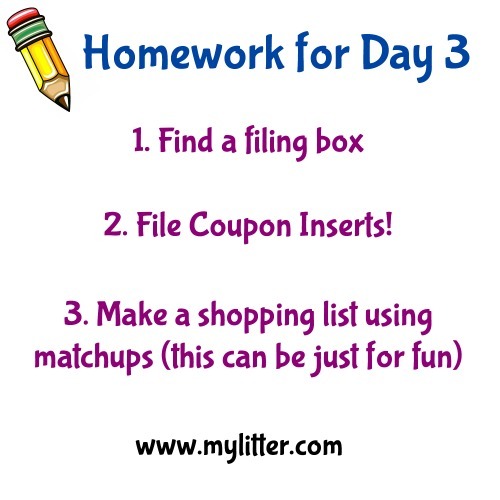 This is a weekend I usually use to get caught up on organizing my coupons (which we will talk about tomorrow). Located on the SKINNY spine of your insert is the date should you ever need to know what insert you are holding. This is very important when we talk about reading coupon match ups. You need to know the date the coupon came out. I usually write mine on the front of the insert when I get them and file them away. If you are a fan of cutting out your inserts, HERE is my tutorial on what to do if you get behind. August 14, 2017 By Tiffany 9 Comments By clicking on our links, we might make a SMALL commission - Thanks for the support! See our full DISCLOSURE here. Use a coupon with a store sale – This is key to getting the lowest possibly price on items. A $.50 coupon is an ok coupon, but when an item is $2.99 regular price and you use that $.50 coupon, you are paying $2.49. Now, if you wait, and combine that coupon with a store sale, say for example that same item is on sale for $1.49, then you use the coupon it is now $.99!! Which is probably a stock up price. If you are not using coupons with store sales, most likely you are not seeing the value of coupons and will give up. All of a sudden coupons will be become VALUEable! One of the biggest mistakes I see newbies making is getting so excited to coupon they cut out all their coupons, and go use them all at once at the store…. spending MORE money “couponing” then if had not used a coupon at all! WAIT. Hold on to your coupon. ONLY use it if you can combine it with a store sale or promotion. Stock up when the item is at the “Stock Up” price. 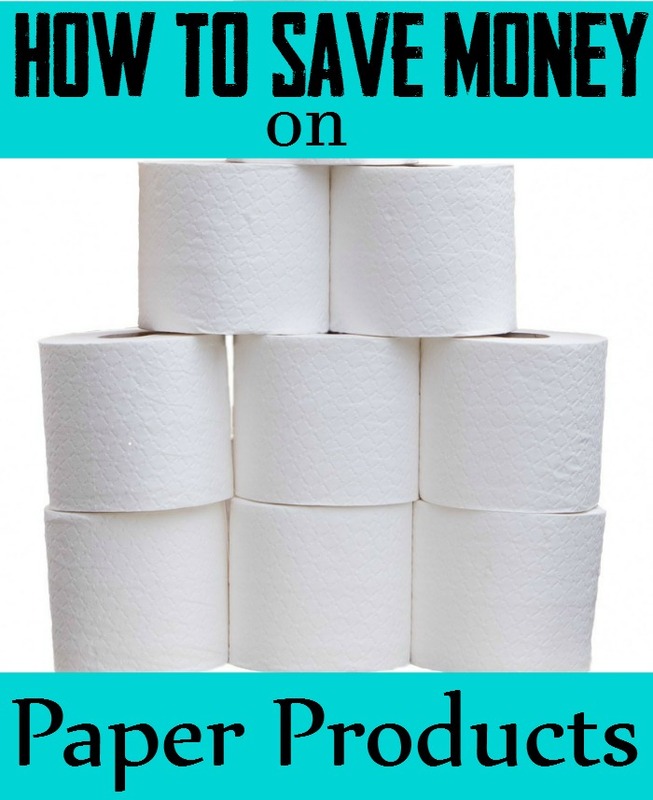 – Seems obvious… but in order to save the most money and lower your grocery bill, you have to only buy items when they are at the lowest possible price combined with a coupon. To do this you will need an idea of what your “stock up” price is. I do a LOT of this work for you by writing the match ups for the stores and using a yellow STAR to tell you if it is a stock up price. Like you can see in the example above. If the item has a star by it, then it is a stock up price. This is why I buy multiple papers, so I have multiple’s of the same coupon. I want to buy as many as I can when the item is at it’s lowest possible price. So that I don’t have to buy that item again, until I can get the same great deal. Be Consistent – If you get papers this week, then skip next week, then get papers the following week, you will not see the BIG savings. You have to be CONSISTENT! This is not a sprint. This is a marathon. You are not chasing a few deals here and there, you are changing the way you think and the way you shop FOREVER. This is a life long habit that you are getting into. People who chase the single deals to buy 100 of them, just to have, don’t hang in there long. They get overwhelmed and give up. That is because they are not really saving much or see a big dent in their overall budget. This is about a new lifestyle, one in which you are going to be saving HUNDREDS each month. You just need to be consistent. Creating a budget is a BAD WORD, I know. Not fun and no one wants to do it… But having a budget doesnt have to be all spread sheets and fights with the husband. It can even be as simple as writing down what you have spent the past few weeks on groceries and start keeping track, that way you can see the difference couponing is making and adjust if you have to. Plus, it can be FUN to see how much you are saving! Buy MUST HAVE items first. I always buy milk and eggs first. These are things we cant live without and I don’t want to end up at the end of the week wondering how I am going to pay for them. Then I plan my meals (we will get to that later) buying the protein and fruit/vegetables from my cash. AFTER that, I coupon HEAVILY for all the OTHER items. Things like cereal, breakfast items, lunch stuff, condiments, snacks, drinks, dessert and all other food items that are “extras”. In the beginning I think it is easier to shop for toiletries and paper products FIRST. Food is a little harder and you don’t see as big of a bang for your buck. So if you are getting frustrated, back off the food and just work on the other stuff! This is an old idea… but it WORKS! Try paying with cash along with your coupons, it keeps you from overspending. When you are working towards becoming an “extreme couponer” or just a money saving MANIAC… you are going to have to re-think the way you have been shopping. No more running to the store everyday to get dinner and just what you need for that day or the next. 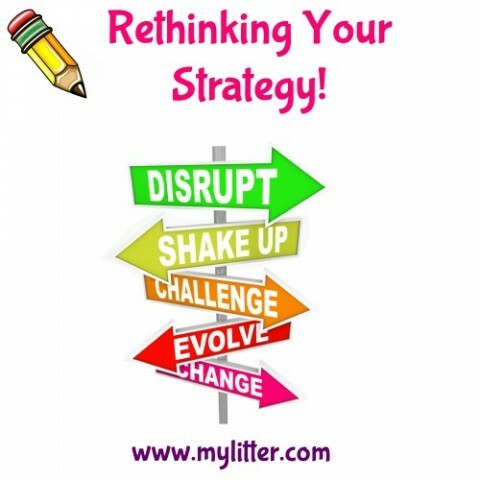 You are going to actually HAVE A STRATEGY!! You will be buying the items that ARE ON SALE and USE A COUPON on them! You will be stocking up on what is the cheapest and best deal each week. Restocking your shelves at home with items you have bought at their LOWEST possible price. I will not be buying everything at one store or at one time. I will be shopping a few SELECT stores and getting the very best deals they have to offer. Then I won’t have to buy those items again until they are on sale and I have a coupon. BUT I will also NOT be running all over town to get 30 more bottles of body wash when I already have 20 at home. That makes me waste my gas and my time, which is valuable! You are working off a 3 month rotation, and in that 3 months you will probably use 1-2 bottles of body wash. SHOP SMARTER! Coupon Lingo is super important to learn, it can be like a completely different language. 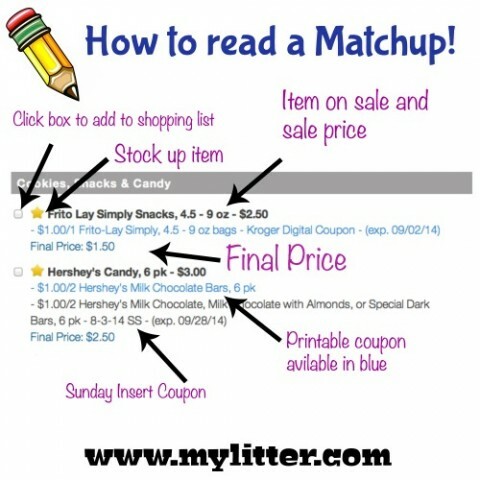 It is really easy to learn though and once you get the hang of it you can decipher all the coupon match ups witch will make all the difference. 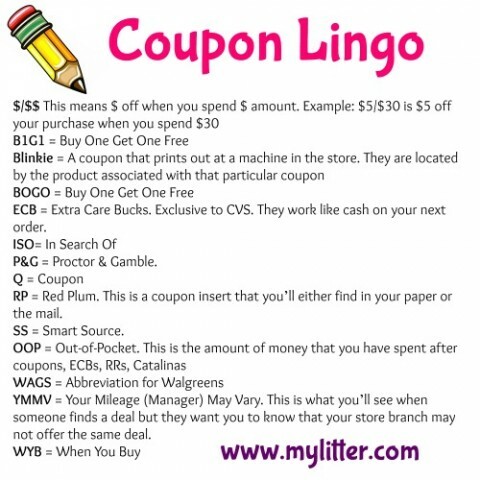 If you want a full page of coupon lingo abbreviations you can go HERE and check it out. – Choose 1 Grocery Store – You are going to think about the stores in your area. If you don’t know what stores you have, Google it, or ask a neighbor. PRINT OFF THAT STORES COUPON POLICY. Read it. You can also use google to find the policy. – Choose 1 Drug Store – Again, think of what you have in your area. It is going to be CVS, Walgreens or Rite Aid. CVS is my personal favorite. But you pick the one you can get to the easiest. PRINT OFF THAT STORES COUPON POLICY. Read it. You can also use google to find the policy. 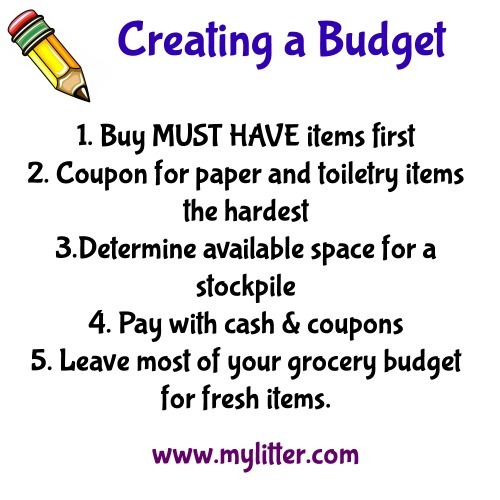 – Decide on a grocery budget – This isn’t going to be fun to see how much you are saving if you don’t know how much you are spending! Go back through the past few weeks and see what you have spent on groceries. Then mentally pick a number and set that as your goal. Let’s say in the past 3 weeks you have spent about $200 a week on groceries. Let’s pick a budget of $180 for the next week and see what we can do with that…. Baby steps…. Meet me back tomorrow for class, and we will go from here!